Is anyone else obsessed with poufs? I've been seeing them all over home blogs, as well as in fancy-schmancy designers' homes. I've wanted one for a while, but as I've mentioned before - I have an aversion to spending money on anything I don't need. Actually, I always turn to Eric if I'm trying to justify a purchase. He can convince me to buy a cute dress every once in a while, and he reminds me that sometimes it's OK to spend money (check out the story of the blender). 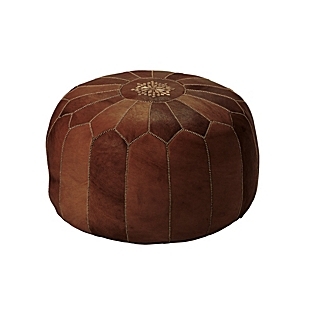 Anyway, I asked Eric if we should get a pouf because I really wanted one. He said, "um, no. What would we even do with it?" But, um, it's $450. So. Anyway. I decided to make one! Want to see it? The thing that actually takes the longest is cutting out the patterns. Don't give up! It gets easier! I used a very sturdy home decor fabric so I left out the lining. I think it was probably a lot easier to just deal with one layer of fabric instead of two. I didn't do the decorative stitching or add the top octagon shaped end-piece. I like the way those look, but with the fabric I chose, I wanted it as simple as possible. As the tutorial says, you can use anything to stuff the pouf. I used old foam, ripped up pillows and a lot of old t-shirts. If you're wondering what I use it for, well, it comes in handy all the time. I use it to sit on, I sleep on it, I eat on it, I read on it, I pray on it, I put stuff on it. Juuuuust kidding. I've literally put my feet on it once. But hey, I like the way it looks. This makes me want a pouf now! Great blog! I love it! You've got skillz, gurrrl. oooh. Nice work. I once made a pouf from a party dress. (This was before BHG came out withe a pattern.) I like your fabric choice. Ooooh a party dress - I bet that would be so cute! Love your Pouf!! I purchased the leather one you show but in white from Joss & Main. I love the fabric you used on yours. I could have poufs in every room...such a fun and functional accent piece! 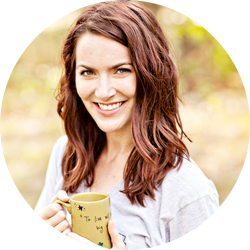 Visiting from Coastal Charm link party...love your blog! You made that???!!! I am super impressed. I think it's gorgeous...and I'm just going to say it...I like yours better than the $450 one. I'm blushing :) Thanks for the sweet compliment, Ashley! SHUT THE FRONT DOOR!!!! You made this?!? Okay, you are my new blog hero! I love the pattern! It turned out fab! I wish I knew how to sew. Thanks for stopping by my blog. Loving yours! I like yours waaaaaaay better! Good work! Amy Butler has a pattern for a pouf in one of her books that I feel in love with a few years ago but never took the plunge! You have given me the courage to just that take the plunge!! No I need to see how much fabric I need.... I wonder what it would look like using an old quilt. Have a great weekend! Now I'm off to see what I can scrounge up to make a pouf... Once again thanks for the inspiration!! I love the idea of a quilt! 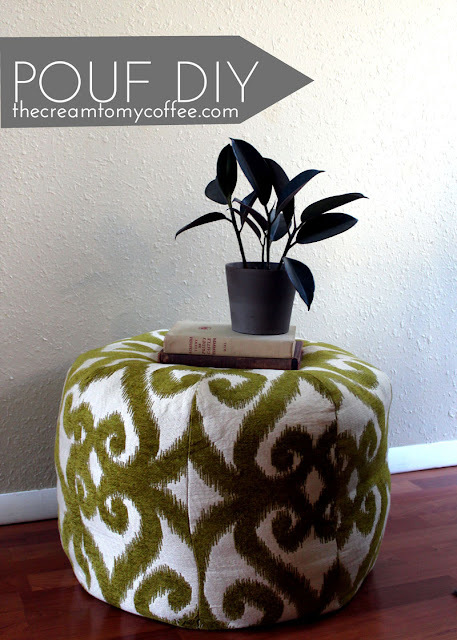 Making a pouf would be a great way to use some old fabric you might have for sentimental reasons but that you don't really use. Oh man, I love re-purposing! I'm putting this on my "to do" list for sure! I love poufs and yours is no exception! It's adorable!! One of these days I'm gonna follow that tutorial and make one. Yep, just like you, I have no idea what I'll do with one, but does that really even matter? This is amazing and way better than the leather one! Great work and excited to be your newest follower! Well done! And at a fraction of the cost, you now have something you've always wanted, and gave your creative flair a work out. Love the fabric you used! Have had this tutorial pinned forever but haven't gotten around to it. We're traveling to Morocco in March--hoping to stuff my suitcase with a small army of poufs. Have one and love it, but yeah, I've put my feet on it like once too. Beautiful pouf. I love your selection of fabric. Your pouf is gorgeous, love that pattern! I've got this linked to my DIY poufs post too today!